non-verbal expression; offers a unique sensory experience when used as a finger paint. 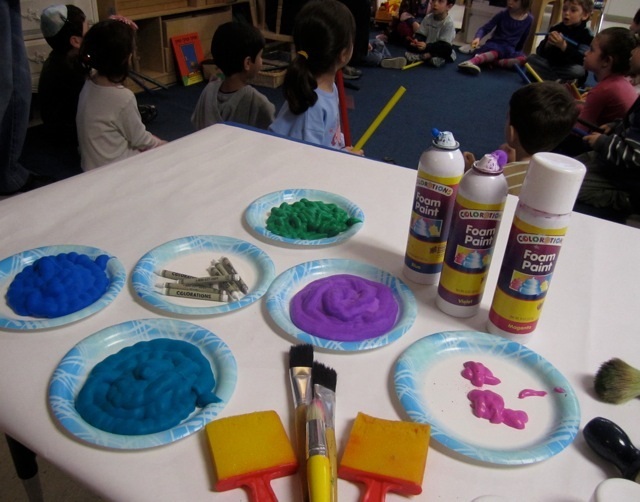 When was the last time you used Colorations® Foam Paint in your classroom? This paint is so much fun, children never get tired of it no matter how many times you bring it out. Here's the way I set it up for a group of 4 year olds. 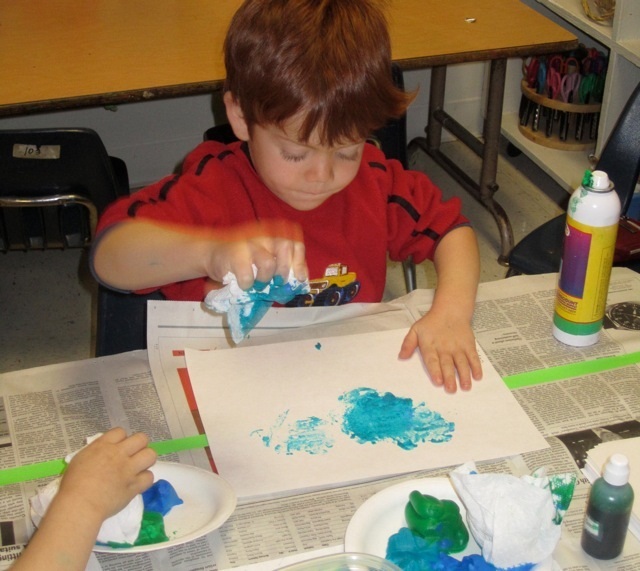 Foam paint is so inviting, children are always eager to get started. Of all the paints I use with children, foam paint is one I can bring out again and again with any age child and they never get tired of it. There's something magical about watching brightly colored foam spritz out of a can and pile up high on a plate! It even makes noise as you spritz in out onto a paper palette, it is the ultimate sensory experience! Sometimes I pass out large bristle brushes and sometimes we use paper towel rags to apply the paint. Here you see four year olds applying foam paint with large chubby brushes. You can see there are white crayon scribbles underneath the paint, if you look at the finished book on the tabletop. And here you see a 3 year old boy applying foam paint with a paper towel. He is using the paper towel as a "painting rag" instead of using a brush. Either paper towel rags or large chubby brushes works fine, and I suggest you try both ways at different times. After all, when you vary how you apply paint, you stimulate new problem solving and a variety of different fine motor skills. Here's the finished result from the 3 year old class. In this particular application, the children were working on "Rainforest Paintings." They used large white crayons to first put down lines that represented rain (scribbles, dots and stripes) then patted foam paint on top with their paper towel rags. 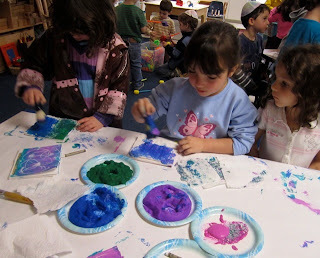 We used foam paint that represented the colors of the rainforest. 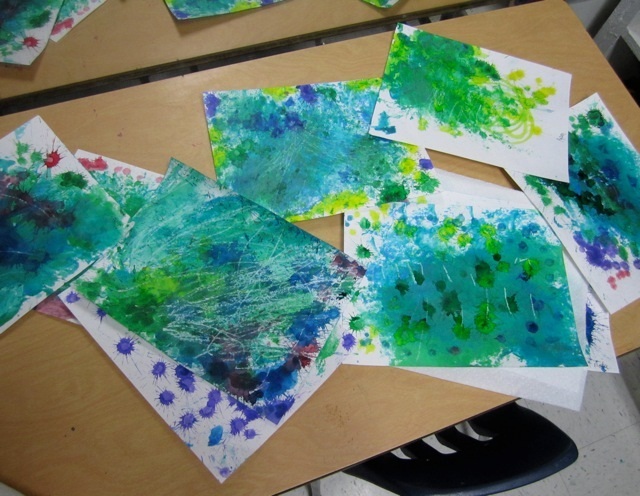 Then, for the final layer, we used Colorations® Liquid Watercolor in bingo bottles to create rain "splashes" on top. The foam paint gives these paintings wonderful color and texture. For an introduction on how to use foam paint, view the video clip below. Thanks for checking in! Art Share: How Do You Get Paint Out of Clothing? One of the questions I most often get about paint is, "Is it washable?" Parents often get annoyed when children come home with paint on their clothes, so teachers have to concern themselves with this. Sometimes the most beautiful paints are "mostly washable" but not completely. And even with "washable" paints, the reds and other colors don’t always come out completely. I find that Zout brand laundry stain remover works best in getting out paint stains. IncredibleFoam® Dough is a wonderfully tactile product for sensory seekers. IncredibleFoam® Dough is a light modeling compound (think substitute for clay) that’s wonderful to touch, squish, and sculpt into 3-Dimensional Art. It comes in dozens of colors and it’s an inspiration for creative young minds, like 4 year old Jordan pictured here. Does he look proud of himself or what? Jordan came up with this idea on his own, by pressing several colors of Foam Dough onto an 11" x 17” piece of construction paper, then later gluing down the pieces with white glue so they’d stick. Foam Dough also makes a great Small Group Activity, as illustrated by this collaborative artwork. A small cluster of school age students created a picture by working together and Foam Dough to start, and they were asked to work cooperatively to decide on a theme and create one unified picture. I loved the result, as well as the teamwork it inspired. Other 3-D figures and sculptures can be created in simple or more complex fashion, depending on a child’s age and interests. We’ve created them here on paper plates so they’re easier to carry around, and they can later be glued down onto the paper if desired. Whether you apply Foam Dough to paper, or shape it into a freestanding 3-D sculpture, it looks great and is always easy and fun to work with. And did I mention it doesn’t make a mess? Foam Dough is soft to touch, and makes a great substitute for traditional play dough and clay. Unlike other clays and dough, it’s virtually mess-free and can be re-used again and again. it never dries out, trust me it’s true, you can even leave it out on the counter for a days and days and its consistency will not alter one little bit. Moreover, foam dough is the perfect sensory play material and exercises important cognitive skills as well as eye-hand-brain coordination. Sensory stimulation is so important in early childhood education, and this is one new sensory play product that you’re sure to love. 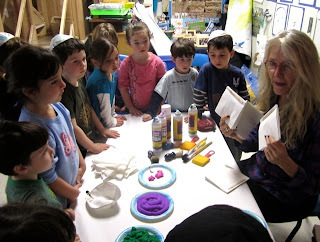 Foam Dough is also completely open ended so it brings out children’s natural creativity. IncredibleFoam® Dough holds lots of discoveries. It even floats! Imagine making little boats for your sand and water table. The IncredibleFoam® Dough Classroom Pack is my favorite, since the color cubes are a delight to look at and easy to distribute. But, you can also purchase IncredibleFoam® Dough in a larger Set of 7 Basic Colors or a smaller Sampler Pack. However you try it, you’re guaranteed a lot of active learning and pure sensory delight!